This blog supports LibraryThing's 999 challenge group. Read 9 books each in 9 different categories, all read in 2009. 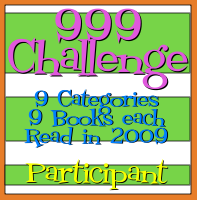 For an added challenge, try completing your books by 9/9/09! The story begins with Danny's arrival at The Keep, an ancient European castle that has come into the possession of his cousin. Though Danny thrives on a busy social scene, he has left New York for the isolated confines of the Keep because he has angered too many people at home. Howie, the cousin, has been very successful in life and has bought the castle with the goal of creating a special sort of resort where people can escape from the modern and allow their sense of adventure and imagination free rein. The story of Danny, Howie and the Keep alternates with that of its author or narrator, an inmate in a state penitentiary for unspecified crimes. He's taking part in a writing program, where he is creating or remembering the story of the Keep. With this story, he hopes to impress the leader of the writing group, a woman named Holly, but in prison, even writing a story can attract the animosity of a man's fellow inmates. There's an interesting tension between the two narratives. Both stories are contemporary, but the story of the Keep, while mostly realistic, incorporates so many Gothic elements--not just the Keep itself, but an ancient baroness, a journey into the catacombs, a looming tower--as to push into the realm of fantasy or parody. The prison narrative, while not outwardly Gothic, still very much involves those Gothic elements such as isolation, confinement, the weight of the past, and forbidden longings. Despite the use of Gothic and metafictional elements, the story is fairly restrained, which sometimes gives the novel a little bit of a truncated feeling. My initial response was to feel a little disappointed by the end of the novel, as if the unique setting and structure of the novel had promised much more than it had been able to deliver. On reflection, my affection for the novel has grown. The Keep is a story about the choices the people make and how those affect their lives and connections with others. It may not indulge the fan of the Gothic novel in the full-on outrageousness one may expect from that genre, but it does use those elements skillfully. An early Nabokov novel about a man named Albinus, a well-to-do German businessman who becomes infatuated with a callow younger woman. There are some similarities here with Pandora's Box or "Der Blaue Engel" (for fans of Weimar Cinema) in this story of a rather pompous individual brought low by his romantic entanglement with a younger woman. Overall, it's a fairly tragic story, as Albinus loses first his marriage, then his daughter, then, in quick succession, his sight, dignity, fortune and life. It has its moments of humor and unique prose. 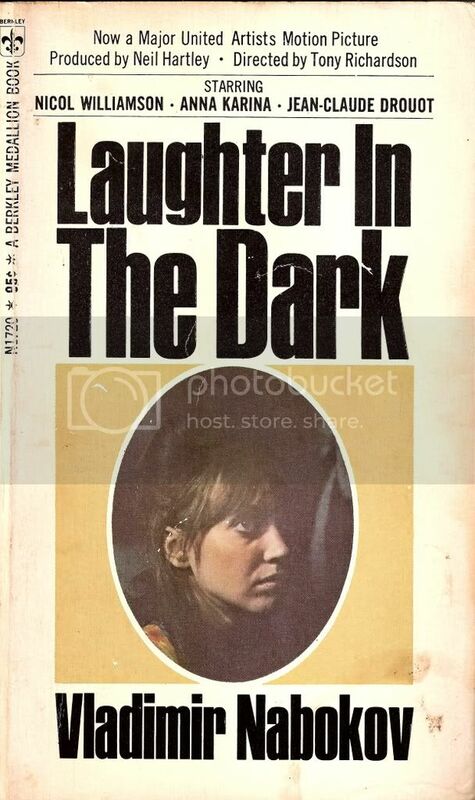 Though hardly as brilliant or radical as Nabokov's later works, Laughter in the Dark is still a well-crafted narrative of one man's folly. The title of the novel is no accident, for it is as gothic a tale as any that was ever set in a crumbling castle on the banks of the Rhine. Its treatment of human evil, isolation and madness could easily qualify it as the pinnacle of 20th Century American Gothic. A shadow has fallen across the house of Blackwood. Though once a prominent family, a possibly accidental poisoning has reduced their numbers to three (two sisters, an uncle) and made the townspeople suspicious of the survivors. The uncle, Julian, has been left physically crippled and one of the sisters, Constance, has developed a phobia about the world outside the house which does not prevent her from accepting visitors. It is left to the younger sister, Merikat (short for Mary Katherine), to venture into town on necessary errands. Gothic literature often features singular characters, individuals who seem eerily plausible yet who are warped in a way that makes them unlike anyone else we've ever encountered. Merikat, who is the narrator and thus our guide through this story, is just such a character. It is clear that she views the townspeople with hostility, going so far as to craft charms--ordinary household items such as books or mirrors placed in odd locations or strange configurations--to keep the world at bay. But soon it does intrude, in the figure of Charles, a cousin from an estranged branch of the family. His healthiness and level headedness seem to promise an opening up of the Blackwood home, a return to normality. But Merikat sees in him a representative of the crudity and selfishness of the outside world and seeks to drive him out through more and more powerful charms. The last of these results in a terrible reaction from the townspeople which sends the Blackwoods into greater isolation, leading to a hauntingly melancholy end to the story. We Have Always Lived in the Castle is an incomparable achievement, a story that will equally charm and disturb in ways that sometimes can be almost intolerable. And you will probably never forget Merikat Blackwood. A murder in a tiny Dartmoor village in the dead of winter sets the stage for this classic Christie whodunit. Several had a motive, few had an opportunity. The most likely suspect is quickly imprisoned, but his fiance remains unsatisfied with the law's conclusions. Determined to clear James Pearson's name, Emily Trefusis sets off with intrepid newspaper reporter Charles Enderby to seek out the circumstances of Major Treveylan's murder. As with all of Christie's books, we get plenty of atmosphere as the plot unfolds in the Dartmoor countryside. Here we see the deepest depths of winter. This novel has all of the elements of a juicy, quick read. The plot and suspense build as we follow Emily on her quest for answers. This is classic Christie- a bit of brain-fluff, for sure, but engaging and well-written. In the mountains of western North Carolina, in the 1930s, Velva Jean Hart lives with her extended family in a community rich in folk tradition and seemingly isolated from the outside world. Velva Jean Dreams of one day going to Nashville to sing at the Grand Ole Opry. But Velva Jean's community is not one that people tend to leave. Velva Jean is limited by her age and family situation. With her mother dead and father run off, she is left to the restrictions of her older sister. With age and marriage Velva Jean's dreams of Nashville fade, but she gains a new desire- to learn to drive. This novel follows Velva Jean from childhood into young adulthood. At every turn it seems that Velva Jean is forced to push her dreams aside. Her story is set in Appalachia during the Depression, and we also see the first signs of outside intrusion into these previously cloistered communities. The Blue Ridge Parkway is about to be cut through the mountains. Even if it does not cut through their village, the new road will affect the lives of all around it. This was an engaging book, with a complex plot line and characters. A wonderful read. This 1899 novel, the story of friends Rachel West and Hester Gresley, provides biting satire of the gender and class conventions that governed late-Victorian England. Set against a trio of painful love stories, Rachel and Hester learn the inconveniences and heartbreak of love. Rachel loves an adulterer, and Hester, a writer, loves her new book, whose manuscript consumes all of her time and energy. These pursuits are set against particular Victorian settings: Hester in the vicarage home of her self-satisfied, traditional, high-church brother, and Rachel in the stately homes of rural Middleshire's minor gentry. Both friends feel acutely the emotional and physical restrictions of their situation. None are able to understand Rachel and Hester's friendship, a deep, emotional attachment formed outside the boundaries of heterosexual marriage. Guiding the plot is what is perhaps one of the most ridiculous displays of masculine bravado: a suicide pact between the two lovers of Lady Newhaven. Cholmondeley is biting in her criticism of Victorian society. Somewhat different from other Victorian satirists, she relies upon plot rather than explanation. Cholmondeley doesn't tell us why we should see absurdity in a particular situation; she relies on plot to do that. Written at the very end of the Victorian era, we start to see the seeds of change in gender relations. The very biting quality of Cholmondeley's novel suggests coming change.